North Carolina’s forests are changing. In recent decades, the pace of development in rural, forested areas has increased significantly, with the trend expected to continue to rise over the long term. 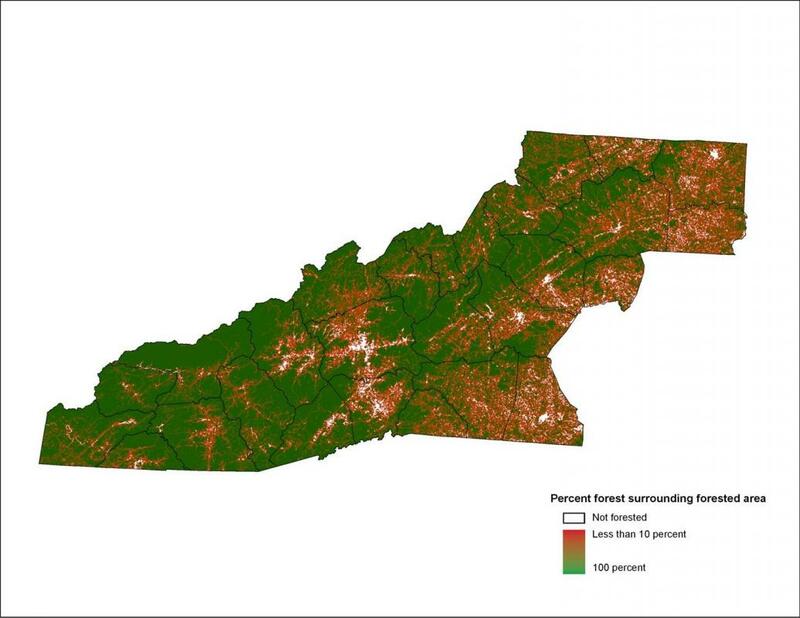 The USDA Forest Service estimates that over the next two decades the density of residential housing will increase on nearly a third of private lands neighboring National Forests in North Carolina. As land is converted from forest to developed uses, forest habitats are broken into ever-smaller fragments. This fragmentation of forested areas has consequences both for forests and for the people who live near them. For some wildlife, fragmented forests are less desirable habitat, impacting population numbers and resilience. Fragmentation also creates more access for invasive species. Fragmented forests are less effective at regulating the movement of storm water, protecting water quality, and preventing erosion. The fragmentation of forests with new housing development also increases the exposure of homeowners to wildfire risks, increases the risk of wildfire ignitions, and makes fighting fires more difficult. USDA Forest Service. National Forests on the Edge: Housing Development on America’s Private Forests. Accessed from: http://www.fs.fed.us/openspace/fote/fote-6-9-05.pdf. USDA Forest Service. National Forests on the Edge: Development Pressures on America’s National Forests and Grasslands. Accessed from: http://www.fs.fed.us/openspace/fote/national_forests_on_the_edge.html. Engels, T. and C. Sexton. 1994. “Negative correlation of blue jays and golden-cheeked warblers near an urbanizing area.” Conservation Biology 8: 286-290; Wear, D.N. and J.G. Greis. 2002b. “Southern forest resource assessment: summary of findings.” Journal of Forestry 100(7): 6-15. Harris, T. and C. DeForest. 1993. “Policy implications of timberland loss, fragmentation, and urbanization in Georgia and the Southeast.” In Proceedings of the 1993 Southern Forest Economics Workshop, edited by D.N. Wear, 70-83. Durham, NC: Duke University Press. Ferreira, L.V. and W.F. Laurance. 1997. “Effects of forest fragmentation on mortality and damage of selected trees in Central Amazonia.” Conservation Biology 11(3): 797-801. Meekins, J.F. and B.C. McCarthy. 2002. “Effects of environmental variation on the invasive success of a nonindigenous forest herb.” Ecological Applications 11(5): 1336-1348. Booth, D.B. and P.C. Henshaw. 2001. “Rates of channel erosion in small urban streams.” In Land Use and Watersheds: Human Influence on Hydrology and Geomorphology in Urban and Forest Areas, edited by M.S. Wigmosta and S.J. Burges, 17-38. AGU Monograph Series, Water Science and Application, Vol. 2. Washington, DC: American Geophysical Union. Fisher, D.S., J.L. Steiner, D.M. Endale, J.A. Stuedemann, H.H. Schomberg, A.J. Franzluebbers and S.R. Wilkinson. 2000. “The relationship of land use practices to surface water quality in the upper Oconee Watershed of Georgia.” Forest Ecology and Management 128: 39-48. Jones, R.C. and L.F. Holmes. 1985. “Effects of land use practices on water resources in Virginia.” Virginia Water Resources Research Center Bulletin 144. Blacksburg, VA: Virginia Polytechnic Institute and State University. 115 p.
National Fire Protection Association. Safer from the Start: A Guide to Firewise-Friendly Developments. Accessed from: http://www.ncfirewise.org/pdf/SaferFromtheStart.pdf. Beringer, J. 2000. “Community fire safety at the urban/rural interface.” Fire Safety Journal 35: 1-23.